It's Friday once more and I get a chance to look at blogging about my Personal favourite items on a particular subject. 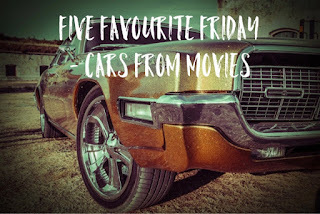 This week I've chosen 'Cars From Movies' as the topic, I've had lots of fun whittling down a long list down to my five favourites (with a couple making an honourable mentions list), but I'm sure this list will divide opinion. I love the original films from the 1960's, 70's and 80's, along with the James Bond films, these are my earliest films I can remember watching. Herbie is the star of the show, as a VW Beetle who has a mind of his own and won't be forced in to something he doesn't want to do. I've only caught a few minutes of the modern remake, but it didn't have the charms of the original films sadly. Name after the noises he makes, Chitty is a true legend of the stage and screen. Nothing seems to get in the way of him, whether it's floating or flying, Chitty had an answer to it. I've even met the 'real' Chitty Chitty Bang Bang in Telford town centre a few years ago. For me, I don't know if the Delorean was iconic before the Back To The Future trilogy, but they certainly held cement it in pop culture. Doc's Delorean had been fitted with a 'flux capacitor' to allow it to travel through time by reaching 88mph, if only all manufacturers fitted them as standard. When I was younger I thought if a car did the magical 88 mph it would time travel, I was ultimately disappointed when I finally made it to this speed. A true British classic car, in a true classic British film. There are so many wonderful scenes that could only be achieved by using these little cars. My personal favourite is driving on the top of the Fiat building. As much as the actor gets the top billing in a James Bond film, the audience will be excited for the car 007 is driving. It was a travesty when Bond used a BMW for some of the Pierce Brosnan films. The DB5 is the quintessential car that people associate with Bond, tricked out by Q, equipped for all that Bonds enemies can throw at him. I still have a toy version of the DB5 with a number of these modifications as working features of the toy, so it will always hold a soft spot in my heart. As I mentioned at the start, it was difficult to narrow down the list so I have got a number of honourable mentions, James Bond’s submersible Lotus Esprit (The Spy Who Loved Me), the Batmobile/ Tumbler (Batman franchise), The Bluesmobile (The Blues Brothers), Ecto-1 (Ghostbusters, Ghostbusters 2), Greased Lightning (Grease) and a slightly dishonourable mention to the Citroën 2CV in James Bond, my mum owned one so its the closest i got to having a model car that starred in a film! I know there are great driving films out there that I've not seen, which contain great cars. Let me know in the comments below if there are any I should watch that contain cars that should have made it on to my list. As always, head to Nikki's blog to her selection. Next week we'll be looking at our favourite Rockabye Baby cover!